It was organized as 2K 8-bit words. The image behind the wafer is of this silicon wafer. A silicon crystal seed is dipped in molten silicon and slowly drawn out to create a cylinder of silicon. These wafers are polished to achieve a very flat mirror surface. It’s hard to imagine engineers needing to be convinced of the value of the microprocessor. A silicon crystal seed is dipped in molten silicon and slowly drawn out to create a cylinder of silicon. These wafers are polished to achieve a very flat mirror surface. TM are dedicated to preserving and sharing these computing and communication technologies that changed the world. TM artworks are fine collectible artworks. On the back is a narrative describing the display, the chip making process, and the artist’s signature. 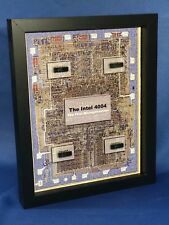 Intel 4004 Microprocessor 4001 ROM, 4002 RAM, 4003 I/O Chipset (P4004) 8"x10"
On the back are the artist’s signature and a narrative describing the artwork and the chip. o F, and mix with carbon. The polysilicon is broken up into chunks. A silicon crystal seed is dipped in molten silicon and slowly drawn out to create a cylinder of silicon. It is signed and dated in the inside top. Reads: Painted by Max Rainet, and includes CP stamp and signature. It is painted in oil paint with an original abstract design that includes faces, waves, dancing ladies, planets, sky. It has a large image of aSignetics 2650 chip. On the back are the artist’s signature and a narrative describing the artwork and the 2650. The programming power and interface flexibility of the 2650 made it a very capable device. Ready to hang. Just Art itself 11" x 9. TM are dedicated to preserving and sharing these computing and communication technologies that changed the world. TM artworks are fine collectible artworks. There is a real computer chip glued to the lower right corner of its picture. 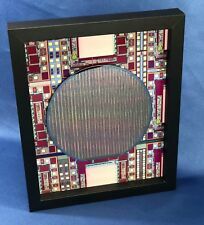 This artwork is based on a GMT Microelectronics SCSI computer chip silicon wafer. This is a silicon wafer made by GMT just before the turn of century in 1999. It was made by GMT Microelectronics. A silicon crystal seed is dipped in molten silicon and slowly drawn out to create a cylinder of silicon. The image behind the wafer is of this silicon wafer. You can read the processor number and date (Look at the upper left corner of the chip covered by the wafer, look at the white rectangular directly below the two blue rectangles. ). These "third generation" microprocessors represented the beginning of the era of multi-core microprocessors. However, the silicon must be made very, very pure. A silicon crystal seed is dipped in molten silicon and slowly drawn out to create a cylinder of silicon. O F, and mix with carbon. The polysilicon is broken up into chunks. However, the silicon must be made very, very pure. A silicon crystal seed is dipped in molten silicon and slowly drawn out to create a cylinder of silicon. You have found the missing pieces to your art collection! Here is a lovely enamel on porcelain painting of a boy and girl in a boat. 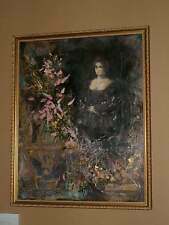 It is signed Litt and I believe the artist is Henri Litt of Belgium. 8" x 10", it is professionally framed in wood to measure 16" x 17". Excellent used condition, no chips or cracks. Please see our Not Just China Store for more of this collection. The design variation of these devices is amazing. They used TTL, PMOS, NMOS, and CMOS technologies. They could focus on its function. The internal architecture of these microprocessors is quite varied. 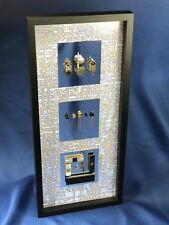 This artwork displays the most influential microprocessors that shaped the early microprocessor industry. However, the silicon must be made very, very pure. o F, and mix with carbon. The polysilicon is broken up into chunks. The chip is a single transistor chip. These are PNP (as opposed to NPN) transistors. The third is actually the bottom of the chip. The blue and pink colors arise from the different types of silicon used in making the transistor. NCube was founded in 1983 to compete in the hypercube parallel supercomputer market. It could support over a 1,000 processors in a single system. Introduced in 1989, the next generation, nCube 2, produced a complete processor on a single chip. However, the silicon must be made very, very pure. A silicon crystal seed is dipped in molten silicon and slowly drawn out to create a cylinder of silicon. These wafers are polished to achieve a very flat mirror surface. Signed by artist, Joy Dibble, in lower right corner. She painted two Watercolor paintings, then cut and weaved / wove them into this wonderful work, 1995. TM are dedicated to preserving and sharing these computing and communication technologies that changed the world. TM artworks are fine collectible artworks. Each decade's technology is presented with a brief explaination of how that technology worked and was used. Work Title:" It Belongs in the Louvre" by Cathy Peterson of Ventura California. -- Date: 2007. Signed C. Peterson 2007, lower right side. Fine Art Collage / Oil Painting. Painted by artist Cathy Peterson. TM are dedicated to preserving and sharing these computing and communication technologies that changed the world. TM artworks are fine collectible artworks. 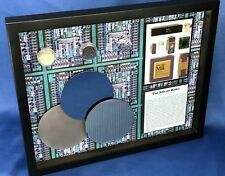 Included in the artwork is the 8"x10" image of a Motorola MC6808 chip on a silicon wafer (with white border for matting it is 8.5"x10.5"). Framed Collage Mixed Media Watercolor Art Sandpipers Music Signed Lily Harmon? In the center of the collage is a flock of sandpipers, sea gulls or other shore bird. Above and below are musical notes or pieces of sheet music with watercolor wash, with a strip of netting over the birds. Kept in a safe place over the years. Go nuclear with francois Paris. as seen in one of the close up pictures. if you look real close you will see a cripmped area in the face area. i tried to show that. This wafer has a gold tone rather than the usual silver tone of most wafers. The chip designation is U07A-ACI and was made in 1996. The image behind the wafer is of this silicon wafer. A silicon crystal seed is dipped in molten silicon and slowly drawn out to create a cylinder of silicon. "THE SWING" by RUTH FREEMAN MIXED MEDIA 5" X 8"
Ruth likes to Paint & Draw from Life. She has a large body of Relief Prints in Woodcuts & Linocuts. She also has a large number of Paintings.All of these works are from 1950-2008. Ruth and her mother Irma studied Art togeather both becoming Art Teachers.They enjoyed many years of Art together; painting & drawing. "PARK STUDY" BY RUTH FREEMAN MIXED MEDIA 5 1/4" X 9"
After several years Practicing Ballet Miss Ruth Freeman's Art Connections were "When POP ART was in Vogue.". Its perfect for hanging up on wall, lay rest on cabinet, or any type of use you wish to have. I am a self-represented artist - Nik Tod. based in Studio in London. 4 of the sides of painting (the thickness) are painted in black color for better look. ABOUT THE ARTWORK My pictures are painted after 25 years of experience in fine art. "SEA SCENE" by RUTH FREEMAN MIXED MEDIA 8 1/2"X11 1/2"
"PARK DAY" by RUTH FREEMAN MIXED MEDIA 8" X 10 1/4"
A charming woman with a mysterious quality within all of her art. Enjoy your stay. by RUTH FREEMAN. I am a self-represented artist - Nik Tod. 4 of the sides of painting (the thickness) are painted in black color for better look. ABOUT THE ARTWORK My pictures are painted after 25 years of experience in fine art. It features an acrylic painting enhanced with charcoal and torn paper on canvas board. A quote is written below the portrait. "MELLON PARK 3" by Ruth Freeman MIXED MEDIA 8 1/2" X 11 1/4"
By the Artist Ruth freeman. by Ruth Freeman.